L12=A partridge in a pear tree! 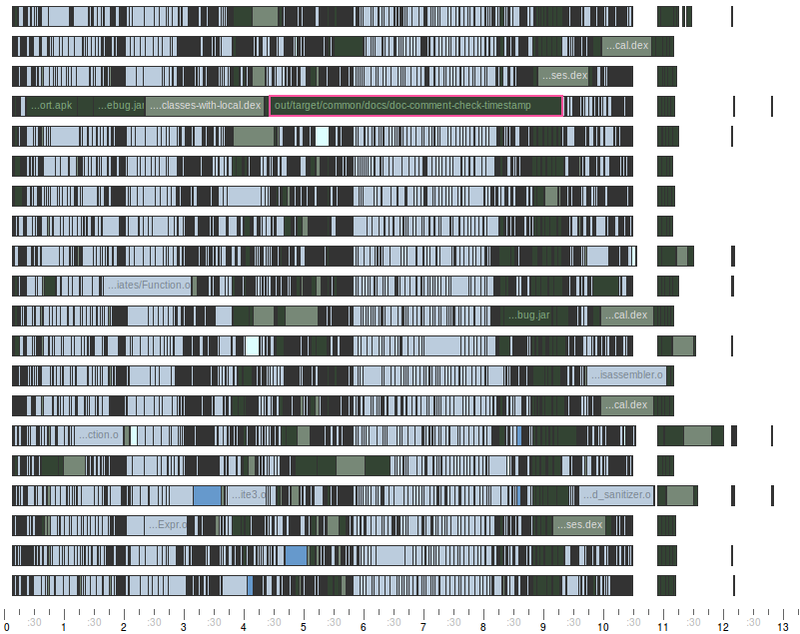 By count, most of the lines here just declare variables, one for each item mentioned in the song. Note how the items are ordered: the last item added is given the lowest index. That means that to construct each verse we simply enumerate every item in the list, in order, starting with the new item in each verse. Line 18 is where the real meat of the makefile begins. Here we use GNU make’s foreach function to iterate through the verses. $(foreach) takes three arguments: a name for the iteration variable, a space-separated list of words to assign to the iteration variable in turn, and a body of text to expand repeatedly, once for each word in the list. Here, the list of words is given by LINES, which lists the starting line for each verse, in order — that is, the first verse starts from line 12, the second from line 11, etc. The text to expand on each iteration is all the text on lines 19-23 of the makefile — note the use of backslashes to continue each line to the next. Line 19 uses several functions to print a blank line before starting the next verse, if we’ve printed a verse already: the $(if) function, which expands its second argument if its first argument is non-empty, and its third argument if its first argument is empty; the $(info) function to print a blank line; and the $(eval) function to set the flag variable. The first time this line is expanded, X does not exist, so it expands to an empty string and the $(if) picks the “else” branch. After that, X has a value, so the $(if) picks the “then” branch. Lines 20 and 21 again use $(info) to print output — this time the prelude for the verse, like “On the first day of Christmas, my true love gave to me”. The ordinal for each day is pulled from DAYS using the $(word) function, which extracts a specified word, given by its first argument, from the space-separated list given as its second argument. Here we’re using n, the iteration variable from our initial $(foreach) as the selector for $(word). Line 22 uses $(foreach) again, this time to iterate through the lines in the current verse. We use line as the iteration variable. The list of words is given again by LINES except now we’re using $(sort) to reverse the order, and $(wordlist) to select a subset of the lines. $(wordlist) takes three arguments: the index of the first word in the list to select, the index of the last word to select, and a space-separated list of words to select from. The indices are one-based, not zero-based, and $(wordlist) returns all the words in the given range. The body of this $(foreach) is just line 23, which uses $(info) once more to print the current line of the current verse. Line 25 has the last bit of funny business in this makefile. We have to include a make rule in the makefile, or GNU make will complain *** No targets. Stop. after printing the lyrics. If we simply declare a rule with no commands, like all:, GNU make will complain Nothing to be done for `all’.. Therefore, we define a rule with a single “no-op” command that uses the bash built-in “:” to do nothing, combined with GNU make’s @ prefix to suppress printing the command itself. Now — where’s that figgy pudding? Merry Christmas! Why is SCons so slow? Recently Dirk Baechle attempted to rebut my findings in an entry on the SCons wiki: Why SCons is not slow. I thought Dirk made some credible suggestions that could explain my results, and he did some smart things in his effort to invalidate my results. Unfortunately, his methods were flawed and his conclusions are invalid. My original results still stand: SCons really is slow. In the sections that follow I’ll share my own updated benchmarks and show where Dirk’s analysis went wrong. Before running the tests, I rebooted the system to ensure there were no rogue processes consuming memory or CPU. I also forced the CPU cores into “performance” mode to ensure that they ran at their full 1.7GHz speed, rather than at the lower 933MHz they switch to when idle. I think Dirk had two credible theories to explain the results I obtained in my original tests. First, Dirk wondered if those results may have been the result of virtual memory swapping — my original test system had relatively little RAM, and SCons itself uses a lot of memory. It’s plausible that physical memory was exhausted, forcing the OS to swap memory to disk. As Dirk said, “this would explain the increase of build times” — you bet it would! I don’t remember seeing any indication of memory swapping when I ran these tests originally, but to be honest it was nearly 4 years ago and perhaps my memory is not reliable. To eliminate this possibility, I ran the tests on a system with 16 GB RAM this time. During the tests I ran vmstat 5, which collects memory and swap usage information at five second intervals, and captured the result in a log. With these changes in place I reran my benchmarks. As expected, there was no change in the outcome. There is no doubt: SCons does not scale linearly. 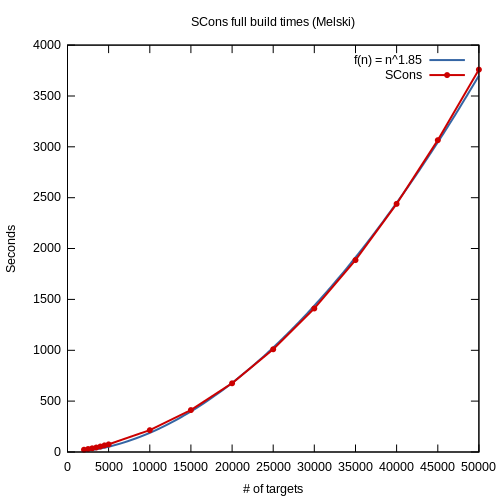 Instead the growth is polynomial, following an n1.85 curve. And thanks to the the vmstat output we can be certain that there was absolutely no swapping affecting the benchmarks. Here’s a graph of the results, including an n1.85 curve for comparison — notice that you can barely see that curve because it matches the observed data so well! For comparison, I used the SCons build log to make a shell script that executes the same series of echo commands. At 50,000 targets, the shell script ran in 1.097s. You read that right: 1.097s. Granted, the shell script doesn’t do stuff like up-to-date checks, etc., but still — of the 3,759s average SCons runtime, 3,758s — 99.97% — is SCons overhead. I also created a non-recursive Makefile that “builds” the same targets with the same echo commands. This is a more realistic comparison to SCons — after all, nobody would dream of actually controlling a build with a straight-line shell script, but lots of people would use GNU make to do it. With 50,000 targets, GNU make ran for 82.469s — more than 45 times faster than SCons. Dirk says that this demonstrates “SCons’ linear scaling”. I find this statement baffling, because his data clearly shows that SCons does not scale linearly. 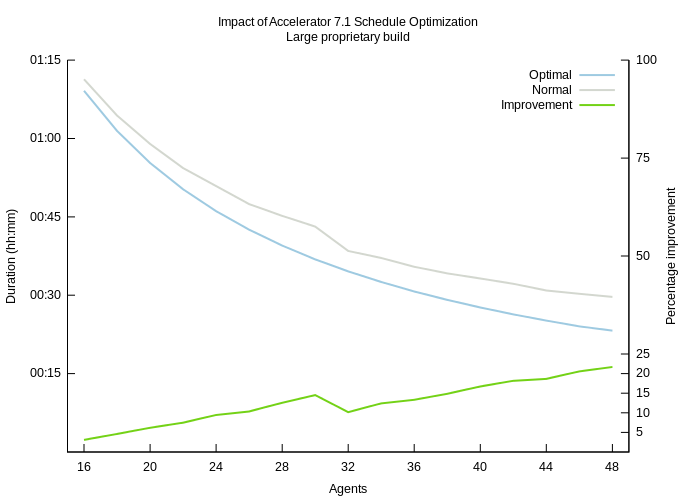 It’s simple, really: linear scaling just means that the build time increases by the same amount for each new target you add, regardless of how many targets you already have. Put another way, it means that the difference in build time between 1,000 targets and 2,000 targets is exactly the same as the difference between 10,000 and 11,000 targets, or between 30,000 and 31,000 targets. Or, put yet another way, it means that when you plot the build time versus the number of targets, you should get a straight line with no change in slope at any point. Now you tell me: does that describe Dirk’s graph? This shows the importance of testing at large scale when you’re trying to characterize the scalability of a system from empirical data. It can be difficult to differentiate polynomial from logarithmic or linear at low scales, especially once you incorporate the constant factors — polynomial algorithms can sometimes even give better absolute performance for small inputs than linear algorithms! It’s not until you plot enough data points at large enough values, as I’ve done, that it becomes easy to see and identify the curve. What does profiling tell us? Next, Dirk reran some of his tests under a profiler, on the very reasonable assumption that if there was a performance problem to be found, it would manifest in the profiling data — surely at least one function would demonstrate a larger-than-expected growth in runtime. Dirk only shared profiling data for two runs, both incremental builds, at 8,500 and 16,500 targets. That’s unfortunate for a couple reasons. 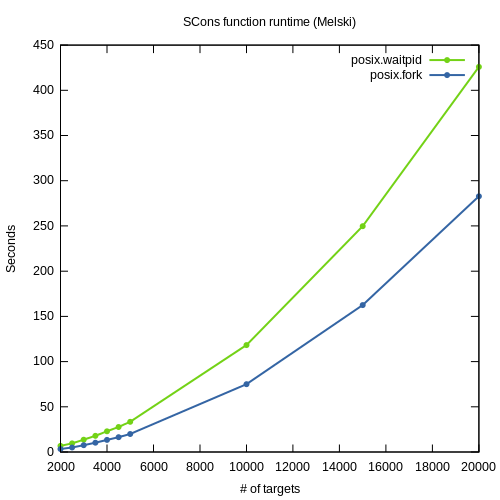 First, the performance problem is less apparent on incremental builds than on full builds. 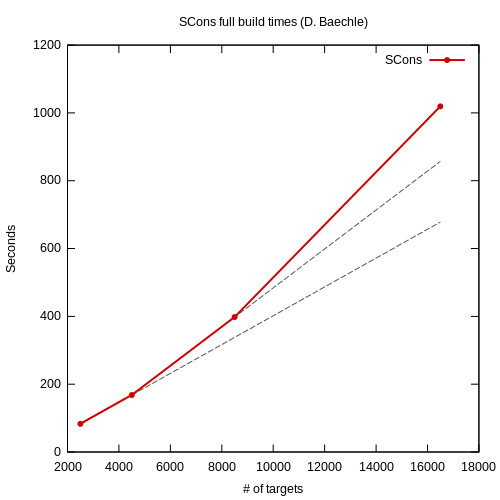 Second, with only two datapoints it is literally not possible to determine whether growth is linear or polynomial. The results of Dirk’s profiling was negative: he found no “significant difference or increase” in any function. Like the overall build time, these curves are obviously non-linear. 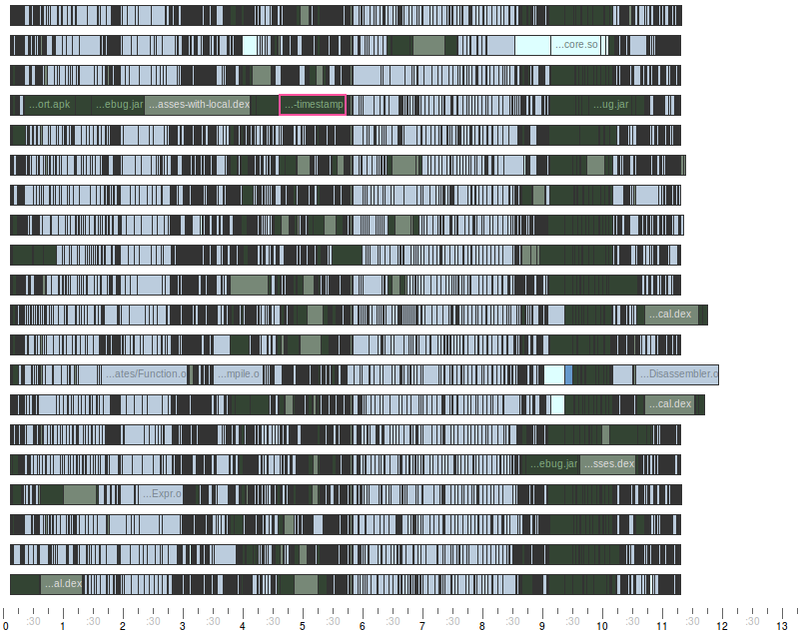 Armed with this knowledge, I went back to Dirk’s profiling data. To my surprise, posix.waitpid and posix.fork don’t even appear in Dirk’s data. On closer inspection, his data seems to include only a subset of all functions — about 600 functions, whereas my profiling data contains more than 1,500. I cannot explain this — perhaps Dirk filtered the results to exclude functions that are part of the Python library, assuming that the problem must be in SCons’ own code rather than in the library on which it is built. This demonstrates a second fundamental principle of performance analysis: make sure that you consider all the data. Programmers’ intuition about performance problems is notoriously bad — even mine! — which is why it’s important to measure before acting. But measuring won’t help if you’re missing critical data or if you discard part of the data before doing any analysis. On the surface, performance analysis seems like it should be simple: start a timer, run some code, stop the timer. Done correctly, performance analysis can illuminate the dark corners of your application’s performance. Done incorrectly — and there are many ways to do it incorrectly — it can lead you on a wild goose chase and cause you to squander resources fixing the wrong problems. Dirk Baechle had good intentions when he set out to analyze SCons performance, but he made some mistakes in his process that led him to an erroneous conclusion. First, he didn’t run enough large-scale tests to really see the performance problem. Second, he filtered his experimental data in a way that obscured the existence of the problem. But perhaps his worst mistake was to start with a conclusion — that there is no performance problem — and then look for data to support it, rather than starting with the data and letting it impartially guide him to an evidence-based conclusion. To me the evidence seems indisputable: SCons exhibits roughly quadratic growth in runtimes as the number of build targets increases, rendering it unusable for large-scale software development (tens of thousands of build outputs). There is no evidence that this is a result of virtual memory swapping. Profiling suggests a possible pair of culprits in posix.waitpid and posix.fork. I leave it to Dirk and the SCons team to investigate further; in the meantime, you can find my test harness and test results in my GitHub repo. If you can see a flaw in my methodology, sound off in the comments! What’s new in GNU make 4.0? After a little bit more than three years, the 4.0 release of GNU make finally arrived in October. This release packs in a bunch of improvements across many functional areas including debuggability and extensibility. Here’s my take on the most interesting new features. Here you see the classic problem with parallel gmake build output logs: the output from each target is mixed up with the output from other targets. With output synchronization, the output from each target is kept separate, not intermingled. Slick! The output doesn’t match that of the serial build, unfortunately, but this is still a huge step forward in usability. The provenance of this feature is especially interesting, because the idea can be traced directly back to me — in 2009, I wrote an article for CM Crossroads called Descrambling Parallel Build Logs. That article inspired David Boyce to submit a patch to GNU make in 2011 which was the first iteration of the –output-sync feature. Obviously, having a more expressive programming language available in makefiles will make it possible to do a great deal more with your make-based builds than ever before. Unfortunately I think the GNU make maintainers made a couple mistakes with this feature which will limit its use in practice. First, Guile was a poor choice. 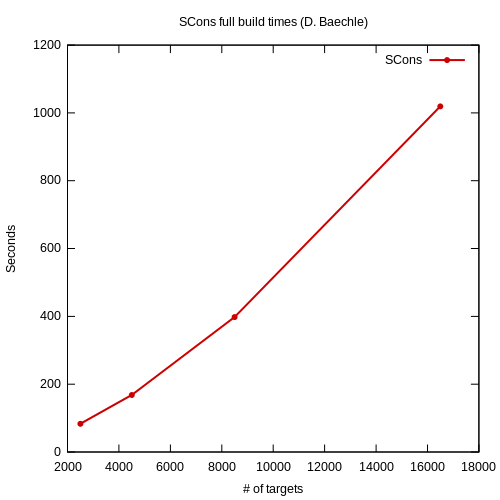 Although it’s a perfectly capable programming language, it’s not well-known or in wide use compared to other languages that they might have chosen — although you can find Scheme on the TIOBE Index, Guile itself doesn’t show up, and even though it is the official extension language of the GNU project, fewer than 25 of the GNU project’s 350 packages use Guile. If the intent was to embed a language that would be usable by a large number of developers, Python seems like the no-brainer option. Barring that for any reason, Lua seems to be the de facto standard for embedded programming languages thanks to its small footprint and short learning curve. Guile is just some weird also-ran. Second, the make/Guile integration seem a bit rough. The difficulty arises from the fact that Guile has a rich type system, while make does not — everything in make is a string. Consequently, to return values from Guile code to make they must be converted to a string representation. For many data types — numbers, symbols and of course strings themselves — the conversion is obvious, and reversible. But for some data types, this integration does a lossy conversion which makes it impossible to recover the original value. Specifically, the Guile value for false, #f, is converted to an empty string, rendering it indistinguishable from an actual empty string return value. In addition, nested lists are flattened, so that (a b (c d) e) becomes a b c d e. Of course, depending on how you intend to use the data, each of these may be the right conversion. But that choice should be left to the user, so that we can retain the additional information if desired. I’m really excited about this feature. People have been asking for additional built-in functions for years — to handle arithmetic, file I/O, and other tasks — but for whatever reason the maintainers have been slow to respond. In theory, loadable modules will enable people to expand the set of built-in functions without requiring the approval or involvement of the core team. That’s great! I only wish that the maintainers had been more responsive when we invited them to collaborate on the design, so we might have come up with a design that would work with both GNU make and Electric Make, so that extension authors need only write one version of their code. Ah well — que sera, sera. ::= assignment, equivalent to := assignment, added for POSIX compatibility. != assignment, which is basically a substitute for $(shell), added for BSD compatibility. –trace command-line option, which causes GNU make to print commnds before execution, even if they would normally be suppressed by the @ prefix. $(file …) built-in function, for writing text to a file. GNU make development migrated from CVS to git. You can find the full list of updates in the NEWS file in the GNU make source tree. It’s great to see continued innovation in GNU make. Remember, this is a tool that’s now 25 years old. How much of the software you wrote 25 years ago is still in use and still in active development? I’d like to offer a heartfelt congratulations to Paul Smith and the rest of the GNU make team for their accomplishments. I look forward to seeing what comes next!